The Porsche Panamera is a unique sports sedan featuring a hatchback. The Panamera is available with all-wheel-drive and comes powered by a choice of V6's and V8's. 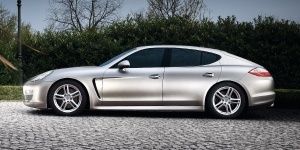 For 2011, the Porsche Panamera is available with a 3.6-liter V6 engine that produces 300 hp. The Porsche Panamera V6 comes standard with rear-wheel drive and is optionally available with all-wheel-drive. Find the used Porsche Panamera of your choice from a dealer in your area. Search our used car listings now.